This entry was posted on August 10, 2016 by Rick. The Baofeng UV-5R is one of the most popular dual band handheld two way radios on the market worldwide. It's compact, feature packed, and very inexpensive. For many users who are new to programming portables, it is also one of the most challenging to program, primarily due to a poorly written user manual and an all but complete lack of support from its manufacturer, Baofeng. Fortunately, there are some helpful resources available from a global community of UV-5R enthusiasts, including an easier to read and understand owner's manual and an excellent software application designed to program the UV-5R from a computer. The programming software is called CHIRP, and it is freely available online. Of course, CHIRP is a great solution, provided you have a computer, an easy to install programming cable and the time to input all the data for 128 channels. But, what if you are on the road or out in the field and don't have a computer handy? What if you need to add in a frequency or program a channel on the fly? We often receive calls from customers who just purchased their first Baofeng UV-5R from Buy Two Way Radios and want to know how to to operate it. More specifically, they want to know how to program their radio manually, directly from the radio itself. So, here's how to do it. Follow the instructions below to manually program your Baofeng UV-5R direct from the keypad of the radio. Step 1. Press [VFO/MR] and enter Frequency Mode. Step 2. Press [A/B] and choose the A Side (upper display). The A side must be used to program channels into the radio. Programming data entered on the B Side (lower display) will not be saved. Step 3. Press [BAND] for the frequency band. Toggle [BAND] to choose 136 MHz (VHF) or 470 MHz (UHF). If the incorrect band is chosen for the frequency entered in Step 5, the radio will cancel the operation. Step 4. Disable TDR (Dual Watch/Dual Standby). It is highly advised to turn TDR off when programming directly from the radio. Step 5. Enter the frequency. Use the keypad to enter the frequency into the radio. Step 6. optional - Enter the transmit CTCSS/DCS code. Step 7. Assign the frequency to a channel. Like the simplex channels, the A side must be used to program the repeater channels into the radio. Programming data entered on the B Side (lower display) will not be saved. If the incorrect band is chosen for the frequency entered in Step 6, the radio will cancel the operation. Step 4. optional - Clear any CTCSS/DCS codes previously assigned to the channel. If no previous codes exist or when setting up the channel for the first time and no codes are needed, set the menu items listed below to OFF. Step 5. Disable TDR (DualWatch/Dual Standby). Step 6. optional - Delete any existing data on the channel to program. Skip this step when setting up the channel for the first time. Step 7. Enter the frequency. Step 8. Input the repeater frequency offset. Step 9. Enter the Transmit Frequency Shift. Step 10. optional - Enter the transmit CTCSS/DCS code. Step 11. Enter the repeater output frequency. Step 12. Assign the receive frequency to the same channel in Step 6. Step 13. Press the [*Scan] button to activate Reverse Mode and display the transmit frequency. Step 14. Assign the transmit frequency to the channel. Step 15. Press the [*Scan] button to exit <i.Reverse Mode. To add more channels, simply repeat the steps above. If these step-by-step instructions are followed correctly, you should be able to program all 128 channels (000-127) in your Baofeng UV-5R as you need. Hi folks I am a total noob at this and would love some help please. I have two Boafeng radios a UV-5R and a BF888, I am wanting to programme the UV-5R so it will talk to the BF888 on three channels ( So I can preset them ) , as I want to be able to let a buddy use the BF radio when we are airsofting . I chose three channels preset so if we get to a site and someone is using one of the channels already we can switch easily. You would need to program each radio to the same frequency on the same channel. The BF-888S does not have a key pad and would need to be programmed from a computer using specific programming software for that model. As for the Retevis, we do not carry that brand, but the model you mentioned seems to be a PMR446 radio. These radios are intended for use in the EU. We are based in the US, so we cannot advise on the use of a PMR446 radio with the UV-5R or BF-888S. If you live in the EU, we recommend that you consult with the agency in your country regarding the use of these radios on those frequencies before attempting to program your radios. Hello all, I'm a total newbie at this, I would like to know what you recommend as the best way to set up and program this radio. 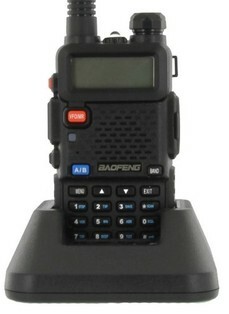 I just bought my first baofeng uv-5r radio, I want to be able to set it up for use. I have experience with radio frequencies as I have had scanners before, but never a transceiver such as this. I notice that many people need frequencies and codes when setting up this radio, where in the world would I be able to get all this information so that I can set up this radio for use ? Hello all, I'm a total newbie at this, and just bought my first baofeng at uv5r Radio. What is the best way to program this radio, and I noticed that you seem to need frequency codes and other things when you were putting in a specific frequency. Wherr in the world can I get all this information to input into this radio? Any information you could give, would be greatly appreciated. Thank you very much. You cannot pick up "police scanners" because they are scanners that receive only. They do not transmit. The Baofeng UV-5R is an analog transceiver. Although it does have a scan function, is not designed to operate as a scanner. Also, many law enforcement agencies now use digital radio systems. An analog radio such as the UV-5R will not hear digital radio signals. Mark Johnson , Radio Menu, "upload to radio" is what you are looking for. I learned a lot watching this videos on this radio, they are long winded! But, they were 2 videos that made the most sense. Just bought a UV-5R. In frequency mode when press band I don't get the option to toggle between 136 VHF and 470 UHF. It just displays 400.000?? What am I missing? Was it purchased new or used? If you are located in the US and the radios are for business use, your company would need to apply for an assigned frequency on the business band. The license is valid for 10 years and there is a fee, the cost of which depends on the type and number of licensed frequencies purchased. You can find more information on our web site at FCC Radio Licensing Services. There are license-free options available to businesses as well, such as MURS and consumer FRS radios, but they require you to purchase radios specifically designed for use on those frequencies. The Baofeng UV-5R is not legal for use on MURS or FRS. Digital radios operating on 900MHz such as the Motorola DLR and DTR series are also license free, but they also require you to purchase radios specifically designed for those frequencies. The Baofeng UV-5R does not operate on 900MHz. Before taking it further, listen to our podcasts An Introduction to Business Radios and FRS Radios For Business? for more information and an in-depth explanation on using two way radios in a business, office or warehouse environment. Forgetting that I'm a luddite with a Tech amateur radio license, using a Baofeng UV-5R programmed by a fellow club member, I recently purchassed a UV-6R, virtually new, from a fellow member that knew nothing about using it (he did have someone program frequencies a year ago but he didn't know what location the frequencies were for (they were not for my location) , nor did he have a manual for the radio. No one I know knew anything about the UV-6R, and almost all searches default to findings for the UV-5R. Is the UV-6r noticeably different than the UV-5R, and is it programmed the same way as the UV-5R? Ken, there is no option to program frequencies for commercial FM broadcast stations because the FM radio is a separate mode. Simply follow the instructions in the manual to activate the "Broadcast FM Receiver" feature. i tried so many times to manually program the hand held radio but as i touch the instructed botton/keypad, nothing change in order to adjust the frequency...the frequency i need to put in is 152050. I have a new BF-F8HP. The manual says that it receives the FM Broadcast band, 65-108 MHz, but I can't figure out how to tune it to this frequency range -- let's say 99.9 as an example, every time I try, it interupts my input and says, "cancelled". There is no direction in the manual. In advance, Thank You. I have problems when i punch a frequence, example 138.850, it jumps automaticly to 138.840. How ca I fix this?? How to scan between 2 frequenties? I bought a baofeng UV-5R and longer antenna for my use in the indiana guard reserve, this brand was suggested by several other guys in my brigade. I also plan to use it on camping trips and such when I can use it to talk to walkie talkies. We are going on vacation this Friday and driving from indiana to destin Florida with family and between us all we'll be in 3 seperate vehicles. My dad has a set of walkie talkies (motorola brand i think) and we will be using them to keep in touch to let the others know when stops are needed for food, fuel and restroom breaks etc. I've read online and watched several youtube videos on how to connect theses radios to the walkie talkies but I can't seem to get through. Yesterday I tried to talk to my dad from my house to his which is only about 3 miles by way the crow flies and there is trees and other terrain between us so I just assumed that it was too much interference to talk 3 miles. But today at work while I was on lunch I tried to talk to my dispatcher who was in the next room, probably 20 feet away and nothing. According to what I saw online it sounded pretty easy to connect rhem. Am I missing something? Both times I coordinated with the person on the other end to make sure we were on the same channel (ch 1), I made sure my unit was in UHF band, punched in the frs frequency code for that channel I found online, keyed up and nothing, dead silence. Btw the work radios we have I think are Kenwood or Motorola, I don't remember for sure cause I normally don't carry one because I drive the truck and don't spend much time on the yard. The ones my dad has are like the little cheap ones you buy at walmart in the camping section. It has to do with setting the PL Tone. Hello to all, Name here is Dave and the call is W3CWE. which . 67. Also we were at are local baseball club In Lancaster Pa.
set the squlech up as far is it could go. That did not do a thing. Any thoughts on this probllem? Many thanks for any help. I simply gave up on manual programing, I purchased the cable off Ebay, I think it was under 5 bucks, plug her into your PC and run CHIRP (free software for programing these guys) then you will be able to make all the settings, and even NAME the frequencies so you can see at a glance who is talking. I use this all the time when we travel, I will look up the frequencies I wish to monitor, also, if able, I will program in the local Law Enforcement to scan those frequencies so I can keep track of possible danger in the area, accidents and so forth so I can avoid such problems on the Highways. Works great, and makes this radio so much more valuable and use able. No, the Baofeng UV-5R operates on different bands and frequencies.